It’s smooth sailing ahead for Sledgehammer Games’ war-torn FPS Call of Duty: World War II, which just received update 1.09. A plethora of issues have been rectified across various departments, including audio, weapon functionality, ranked play and general progression. Game Director Michael Condrey used Reddit to highlight a couple of noteworthy patches, such as the fix applied to unbalanced VO volume in War Mode (‘hush mode’ now activated), and the removal of friendly shellshock explosions. Update 1.09 marks the first amendment for 2018, and follows December’s batch of weapon and UI fixes. 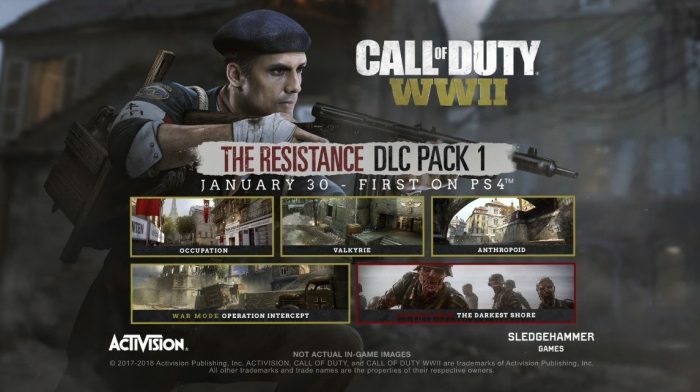 The first DLC pack — The Resistance — will be live from January 30 on PlayStation 4.